While Alaskans have long endured dense mosquitoes and frigid air, we've always had the absence of venomous snakes and dog ticks. But the latter may be establishing themselves here. Ticks that infest red squirrels, snowshoe hares and a variety of birds have always been present in Alaska, but a team of biologists and veterinarians recently found five non-native ticks on Alaska dogs and people. In a recent study published in the Journal of Medical Entomology, researchers identified brown dog ticks, American dog ticks, Rocky Mountain wood ticks, deer ticks and Lone Star ticks in Alaska. A few of those creatures hitchhiked up on animals and humans that had recently visited the Lower 48. But some had not. "It appears the American dog tick is established in Alaska," said Kimberlee Beckmen, a wildlife veterinarian with the Alaska Department of Fish and Game and a co-author of the study. "Some of the dogs (with the tick) had not traveled or hadn't had contact with traveling dogs." "That is not a good thing," said Randy Zarnke, Beckmen's predecessor at the Department of Fish and Game. He wrote a 1990 paper about the potential for some harmful ticks to survive our winters should they reach Alaska. "(The American dog tick) attaches to humans and can spread diseases that we haven't had to worry about up until now." The American dog tick can transmit the bacterium that causes Rocky Mountain spotted fever and can secrete a toxin that can cause tick paralysis in dogs and humans, said Lance Durden of Georgia Southern University, lead author on the paper. Tick paralysis can be fatal if it affects breathing muscles. In the study, three researchers looked at ticks delivered to them from around the state. Veterinarians and others sent to Fish and Game or the state veterinarian ticks they plucked off their dogs in Anchorage, Chugiak, Fairbanks, Homer, Juneau, North Pole, Sitka, Valdez and Wasilla. People pulled ticks from their own bodies and sent them in from Anchorage, Denali Park, Fairbanks, Fort Wainwright, North Pole and Willow. In one odd case, a clerk found a Lone Star tick crawling across a counter in Kotzebue. 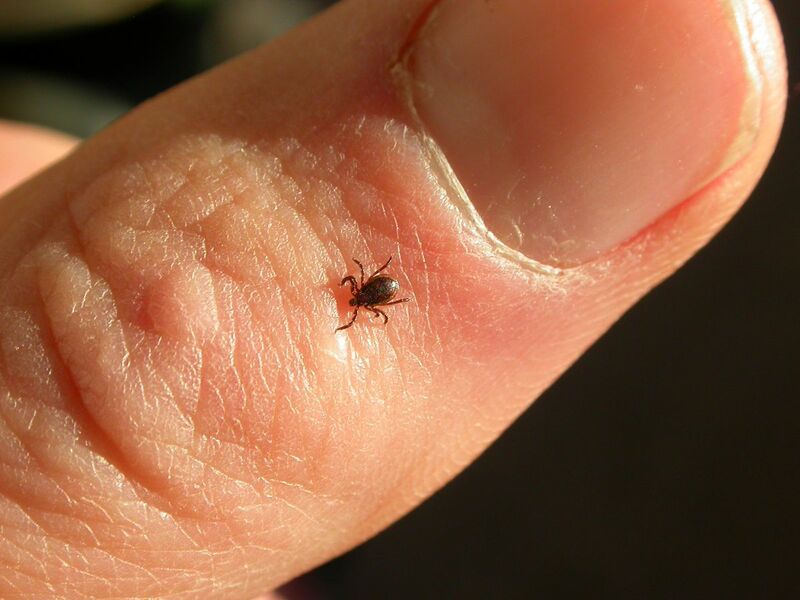 So far, Alaskans have not reported contracting Lyme disease in Alaska. But Beckmen said our native squirrel and hare ticks are "competent vectors of Lyme Disease and Rocky Mountain Spotted Fever. "All we need is an infected person to be bitten by one of our native ticks to spread that to wildlife and then to other people," she said. 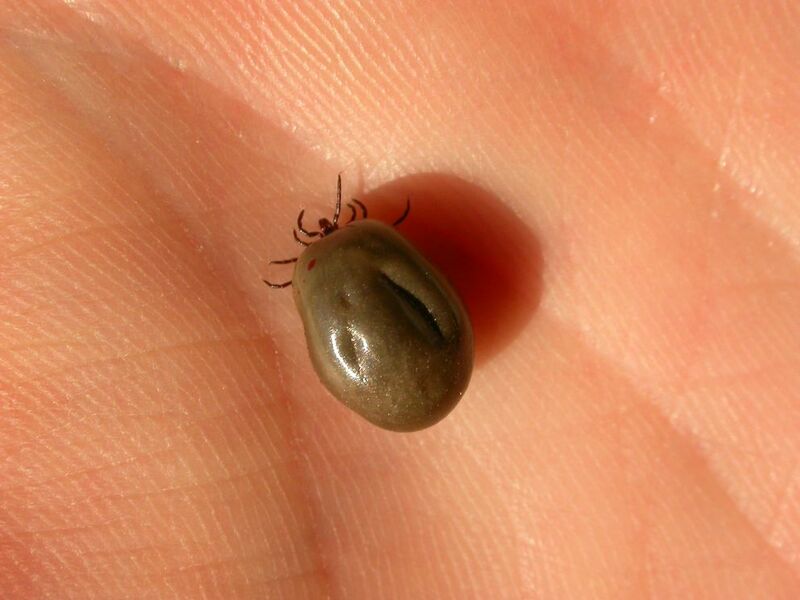 In some of their life stages, ticks are not much larger than the head of a pin. Some can live indoors. Others cling to vegetation until an animal brushes past. They then climb onto skin, bite without causing pain, and swell with the blood of their host. They balloon up and drop to the ground to lay about 1,000 eggs in a large mass. In spring, tiny six-legged larvae hatch and search for a host. If they find one, they attach, engorge, drop off and molt into an eight-legged nymph. Nymphs need another blood meal to become adults, which search for yet another meal before feeding and mating on the host animal. Though the sample size of ticks found in Alaska is small, the new ticks in Alaska are somewhat of a surprise. "The establishment of non-natives is what jumps out," said Derek Sikes, curator of insects at the University of Alaska Museum. "We've been isolated from these because we've been cold and haven't had these ticks here," Beckmen said. "We're very vulnerable and tick-borne diseases are the most rapidly spreading diseases in the U.S."
Beckmen encourages people to use tick preventative treatments on their pets before traveling and after they get back. That will help slow the introduction of nasty creatures that have historically not been here. "We don't yet know if the American dog tick can survive Alaska winters, but it probably can, at least the milder coastal regions," Durden said.